Well, let me tell you. British Airways Avios are pretty easy to earn because their credit card usually has a large sign-up bonus, and you can quickly transfer Chase Ultimate Rewards into Avios to book a flight. And when I’m looking to book a short non-stop flight, Avios are the first points I look to use because flights start as low as 7,500 points each way. Which British Airways Credit Card Should You Get? Most airlines charge a set price for a ticket, no matter how far you’re flying or how much the actual ticket might cost if you pay cash. With British Airways, their award flights are distance based, so the number of points you’ll use to book your ticket is based on the number of miles you will travel. But British Airways Doesn’t Fly Within the United States! That’s true, but they partner with American Airlines, which flies practically everywhere in the U.S. And the most amazing thing is that most of the time you’ll pay far less using British Airways Avios points for that plane ticket than you would with American Airlines AAdvantage miles. For example, my mother-in-law didn’t feel like driving four hours from Fresno to our home in Orange County to visit the grandkids. We didn’t want the kids to miss out on spending time with Grandma, so we booked her tickets for only 4,500 Avios each way, or 9,000 total points. That flight on American Airlines would easily have cost 25,000 AAdvantage miles round-trip. If you want to earn British Airways Avios points, you can earn them directly with the British Airways credit card or you can earn them with credit cards that earn Chase Ultimate Rewards or American Express Membership Rewards. Of course, you can always earn Avios by flying with British Airways or one of their partner airlines and credit your flights to British Airways, but that’s a much longer process than a sign-up bonus from a credit card. With the Chase British Airways credit card, you can earn up to 100,000 Avios if you’re a big spender. You start out with a bonus of 50,000 Avios after spending $3,000 within the first 3 months of applying for the card. You’ll get another 25,000 Avios after spending $10,000, plus an additional 25,000 if you spend a total of $20,000 within the first year. That works out to a 100,000 Avios if you can spend $20,000 or more in a year on the British Airways credit card. When you spend $30,000 in a calendar year, you’ll receive a Travel Together Ticket, which is British Airways’ Companion Pass. At $682 to $1,250, the taxes and fees are too high to redeem for an Economy ticket, but it’s an excellent choice if you’re looking to buy a Business Class flight from the U.S. to London. The American Express Platinum card is one of the original premium credit cards. It now offers a 60,000-point bonus after spending $5,000 within 3 months and 5x points on flights and hotels booked with Amex Travel. To help offset the $550 annual fee, each year you’ll receive $200 in airline fee credits and $200 in Uber credits. Additionally, you’ll have access to American Express Centurion Lounges and over 1,100 other airport lounges. American Express Membership Rewards points transfer 1:1 to British Airways and Amex will occasionally offer bonuses in the 30% to 40% range to encourage transfers. The American Express Premier Rewards Gold card also earns Membership Rewards points that transfer 1:1 to Avios points. It earns 3x points for flights and 2x points on gas, groceries and dining. The annual fee of $195 is waived the first year and offers a 25,000-point bonus after spending $2,000 within the first 3 months. The Gold card offers $75 in hotel credits and room upgrades when booking with The Hotel Collection and an annual $100 airline fee credit. The Chase Sapphire cards are the Swiss Army knife in the travel world because the Ultimate Rewards points they earn are so flexible. British Airways is a 1:1 transfer partner with Chase Ultimate Rewards. The Chase Sapphire Preferred card offers a test drive since the annual fee of $95 is waived the first year. With it, you’ll earn 50,000 Chase Ultimate Rewards points after meeting the minimum spend of $4,000 within 3 months of applying. The best use of these points is to purchase travel like cash or transfer them to a partner like British Airways. The Chase Sapphire Reserve is the premium version of the Preferred card. It offers premium benefits beyond what the Preferred offers. However, the annual fee of $450 is not waived the first year. In my opinion, perks like a $300 travel credit, 3x points on travel and dining, Global Entry reimbursement and complimentary Priority Pass Select membership more than offset the difference in annual fee. The Chase Ink Business Preferred is the business version of the Chase Sapphire cards. You’ll earn 80,000 Ultimate Rewards after meeting the minimum spend of $5,000 within the first 3 months after applying. The $95 annual fee is not waived the first year. But you’ll earn 3x points on the first $150,000 spent on travel, shipping, internet, cable, phone and online advertising. Additional employee cards are available at no charge, and the Chase Ink card offers up to $600 in cell phone theft or damage protection when you pay your cell phone bill with the card. To earn the most amount of British Airways Avios in a short period of time, we’ll need to strategically apply for a few credit cards that will earn Avios directly or that earn points that can be converted into Avios. You’ll need excellent credit to get approved for all of them, but when you do, you’ll have at least 219,000 Avios points to book some incredible trips. First Month: Apply for the Chase Sapphire Preferred to earn 50,000 points after you spend $4,000 in month one. The $95 annual fee is waived the first year. After meeting the minimum spend, you’ll have at least 54,000 Chase Ultimate Rewards points. Transfer your points to British Airways Avios on a 1:1 basis. Second Month: Apply for the Chase Ink Business Preferred to earn 80,000 points after you spend $5,000 this month. Once you hit the minimum spend, you will earn at least 85,000 Chase Ultimate Rewards points. That’s 80,000 points from the sign-up bonus and 5,000 from using the credit card. Once these points post, transfer these points to British Airways as well. This credit card has an annual fee of $95 that is not waived the first year. Third Month: Sign up for the Chase British Airways credit card to earn 50,000 Avios after you spend $3,000 this month. You’ll have 53,000 Avios after meeting your minimum spend. The $95 annual fee is not waived the first year. Because the British Airways credit card is not subject to the Chase 5/24 Rule, you’ll want to apply for it after the Chase Sapphire Preferred and Chase Ink Business Preferred. For additional bonus Avios, you can spend $20,000 on this card to earn up to 50,000 additional bonus points within one year of applying. Fourth Month: Apply for the American Express Premier Rewards Gold Card to earn 25,000 Membership Rewards after meeting the $2,000 minimum spend requirement. The $195 annual fee is waived the first year. You will then transfer these 27,000 points to British Airways on a 1:1 ratio. Depending on when you’re reading this, American Express may also be offering a promotion where you’ll receive 30% additional Avios for making the transfer to British Airways. Note: If you spend on the credit card bonus categories, you’ll earn even more points. As always, only spend on a credit card what you can pay off each month. Earning a few credit card rewards are not worth getting into debt and paying the banks a lot of interest. If you are having a hard time meeting the minimum spend of the credit cards we recommend for this strategy, check out our tips to meet credit card minimum spend requirements. Because British Airways is a foreign airline, you may not know much about their loyalty program. British Airways is part of the OneWorld Alliance, which means you can redeem Avios with any of 17 partner airlines. The best redemptions are for non-stop flights because British Airways charges points based on segments and distance. Go here for a full review of British Airways Executive Club loyalty program. Generally, you won’t want to book a British Airways flight from the United States to London’s Heathrow Airport using British Airways Avios points because the fuel surcharges and taxes can be quite expensive compared with paying cash for a regular ticket. So, what type of flights should you use your Avios for then? Often, the best ways to use British Airways Avios are not actually on British Airways. With their partnerships with American Airlines, Alaska Airlines and Aer Lingus (to name a few), you can book some amazing travel using Avios. 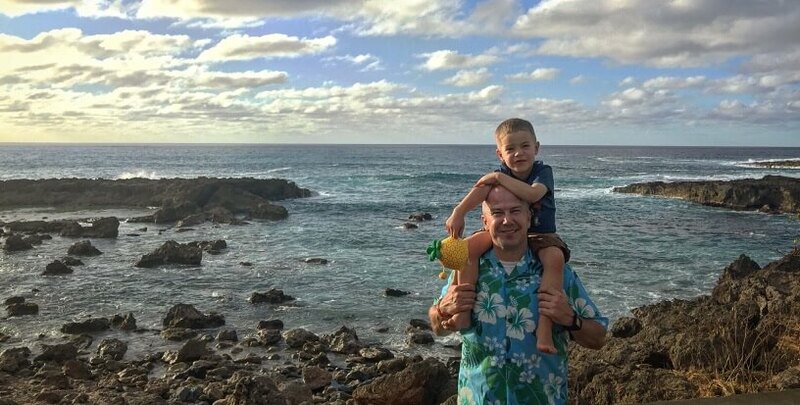 I used Avios to fly non-stop from Los Angeles to Honolulu, Hawaii, with my son and his Godfather to spend a week at the Marriott Ko’Olina. From the West Coast, you can fly non-stop to Hawaii for only 12,500 British Airways Avios. 25,000 points for a round-trip flight is much lower than any other airline program offers. Along the West Coast, you can fly on American Airlines or Alaska Airlines from San Diego, Los Angeles, San Francisco, Portland and Seattle for only 12,500 points each way. North Shore Hawaii with Timmy in March 2016. This is the cheapest route using Avios between the U.S. and Europe. At just under 3,000 miles of distance, you can book an Economy flight for 12,500 or a Business Class flight for 37,500 on Aer Lingus, an airline partner of British Airways. I used Avios to fly to the U.K. to see the Miami Dolphins play the New York Jets at Wembley Stadium a couple years ago. We flew an overnight to Boston to explore the city, walk the Freedom Trail and position for the Aer Lingus flight. 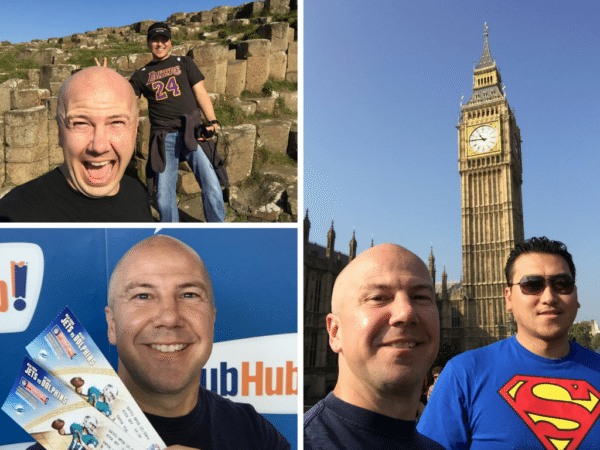 Then we stayed in Dublin for a few days before heading to London for the football game and meet Big Ben. Giant’s Causeway, Big Ben and Fins vs. Jets tickets. One of my favorite (and most frequent) uses of Avios is booking MileSAAver award flights on American Airlines for non-stop domestic tickets. You can fly up to 650 miles for only 7,500 Avios each way. When my Uncle was in hospice care, I used Avios to avoid close-in booking fees that American Airlines would have charged for my flight to Phoenix. Not only was my flight cheaper than using AAdvantage miles, I also didn’t have to pay the $75 fee for booking an award ticket at the last minute. In the U.S., upgrading a paid ticket to Business or First Class is often a waste of money. The number of miles required can be close to what it would have cost to book the premium cabin ticket in the first place. But, outside the U.S., upgrading a paid ticket can be a great use of Avios. For example, you can upgrade a paid Economy ticket to Business Class on British Airways from London to Frankfurt for as little as 4,500 Avios during peak season and 3,750 points during off-peak. You have the option of paying a portion of your plane ticket with points and the remaining balance in cash when flying on British Airways. This is an excellent option when trying to stick to a budget when you don’t have enough points to completely pay for a ticket, or when you cannot find award availability. Although we’ve shown you how to earn at least 219,000 British Airways Avios in just 4 months, the reality is that not everyone is ready, willing or able to follow this strategy. If you were to apply for just one of these four credit cards, I would recommend getting the Chase Sapphire Preferred. You can easily convert Ultimate Rewards points into Avios whenever you need them, and you will earn 2x points on travel and dining. The British Airways Visa Signature card only offers bonus points when purchasing a British Airways ticket. With the Preferred card, you’ll maintain flexibility should you want to book a cash flight using Ultimate Rewards or if you want to transfer to any of the other airline or hotel transfer partners.